American Trombone player, vocalist, composer and arranger David L. Harris Jr. embodies the edge of modern jazz and the sultriness of blues. Every time he steps on stage, David takes us on the emotionally engaging journey of love and liberation, wrapped in a sound that embraces the groove, grit and swing of the past. 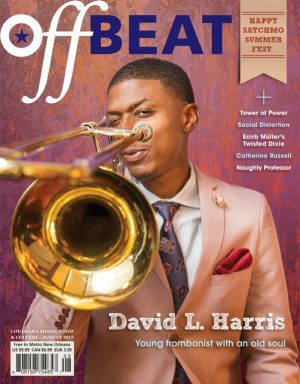 Growing up in a neighborhood called Scotlandville, in Baton Rouge, La, David L. found his fingers pressed against the sliding brace of the trombone at the age of sixteen and has never let go since. Music lovers have stepped and grooved to the sound of his trombone at some of the liveliest jazz festivals in the world, like The Newport Jazz Festival, The Montreal Jazz Festival, and The New Orleans & Heritage Jazz Festival . David L. has graced legendary concert halls, such as the Apollo Theatre in Harlem, NY, The Lincoln Center in New York, NY, and The L'Olympia Music Hall in Paris, France; and has played beside some of the most astonishingly talented bands and vocalist like Dee Dee Bridgewater, Wynton Marsalis, Shannon Powell, Aaron Neville, Delfeayo Marsalis, Dr. Michael White, and The New Orleans Jazz Orchestra. "From my trombone, I speak of all that my ancestors have spoken and all that is to come." "Plunger mute mastery, conversational and confessional vocals"